Our Corporate Challenge is gearing up for 2019. We'd love your business to sign up today! The Challenge really starts June 1st and you have four months to turn a £50 starter fund into as much as they can. In the past two years companies have come up with some fantastic fundraising ideas from sky dives to bake-offs and from family fun days to all you can eat competitions. Teams are encouraged to join in our hospice events such at Pendle Pub Walk, Burnley 10k and Zipline Experience where your sponsorship money will be added to your team totals. You can collect bags of good quality unwanted clothing and they will raise £3.50 per bag to your total too ! LAUNCH DAY: Friday 31st May. Tea/Coffee and pastries will be served. The 2019 Official Sponsor of the Corporate Challenge is Stitch-it. Mark Robinson is the Director and he was very keen to give his support at the soft launch event. We have started to recruit companies to join in this year’s Corporate Challenge. Businesses from across Burnley and Pendle gathered on Friday night to celebrate raising an incredible £157,036 for Pendleside Hospice – a £60,000 increase on last year. Around 160 people turned out to Pendleside Hospice’s third annual Corporate Challenge Awards, held at Burnley Mechanics. This year the Corporate Challenge saw 37 local businesses in a head-to-head battle to raise the most money for the Hospice from 1st June to September 30th. Each participating company was given £50 donated by sponsor Charter Walk Shopping Centre in Burnley to start them on their way. Among the winners from the event were Burnley and Pendle Slimming World who took home both the overall Corporate Challenge Champion Award and, for the third consecutive year, the award for raising the most cash with £28,821 – £2,000 more than their total from 2017. The Slimming World team also took home the Innovation Award for pulling out all the stops and setting a challenge for their members by bringing a Fire Walk to Burnley in August. We’ve been supporting Pendleside Hospice for three years and next year we’re aiming to reach £100,000 raised by Slimming World – we have loads of fundraising ideas in the pipeline already. Winning three awards is testament to the incredible team spirit we have at Slimming World – we couldn't do this without our fantastic team and members, so these awards are for them. We support the Hospice because it touches the lives of absolutely everybody in our local area. We’ve hosted so many events throughout the challenge and to come out as the top fundraisers makes me incredibly proud. Other notable winners included Michael Woodvine from Business First, who took home the Laugh Out Loud Award for having his legs waxed from top to bottom. I like to call it an audition, but it was 15 minutes of pain – I have very hairy legs! Our marketing team asked if I was up for doing something crazy, and of course I said yes, but that was before finding out what it was. It’s all for a good cause and my nerves were calmed with a glass of prosecco afterwards! This was our first year supporting through the Corporate Challenge and we’ve had a great time fundraising. Hosting the Corporate Challenge and seeing the lengths these businesses have gone to in their fundraising efforts makes me extremely proud to be part of the Hospice. To raise such a huge amount over just four months of fundraising is just incredible and to raise £60,000 more than last year has blown me away. 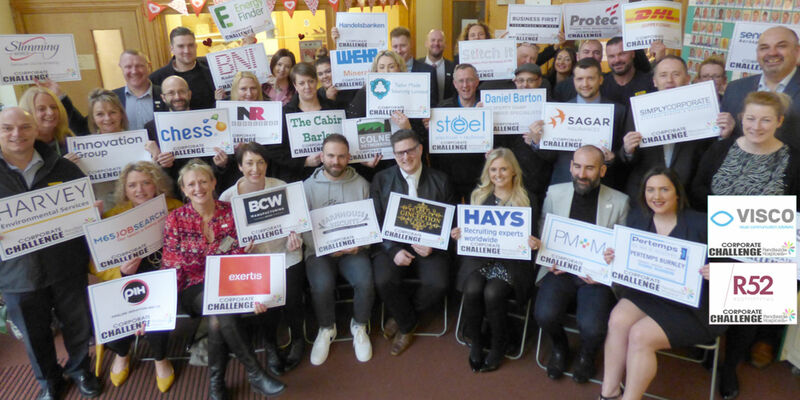 We’re so grateful to have had a number of prominent local businesses taking part in the challenge and getting so much commitment from all their members of staff. The Corporate Challenge isn’t just about raising much-needed funds for the Hospice – it brings numerous benefits to the businesses including team-building, networking, publicity and helping to meet corporate and social respon­sibi­lities. The evening, which was hosted by 2BR’s Managing Director Simon Brierley, featured a drinks reception provided by DRN Solicitors and a two-course meal, music by Steeros, a raffle and auction.